While Microsoft has long held the title as the technology firm squatting the largest mound of cash, Apple may soon give the Redmond, Wash.-based software giant a run for its money, literally. The Seattle Post-Intelligencer's Todd Bishop points out that Microsoft has reduced its cash balance from more than $64 billion less than four years ago to $26.3 billion this year through large stock buybacks, dividends and acquisitions. Meanwhile, Apple over the same period has seen its spare coin surge from $5.5 billion to $19.5 billion as a result of its industry-leading growth in the personal computer market and its dominance in the digital media player sector. "Keeping too much cash on the balance sheet can raise eyebrows among investors, who often want companies to reinvest the cash in the business or to return the money to shareholders through dividends or stock buybacks," Bishop noted. "Investors are now watching Apple's growing cash balance in much the same way they did Microsoft's a few years ago." Cisco still sits between Microsoft and Apple with $22.7 billion in cash. Google is a somewhat distant fourth with $12.1 billion. Continuing to plug away at the next maintenance and security update to its Leopard operating system, Apple on Monday is reported to have seeded Mac OS X 10.5.3 build 9D27 to its vast developer community. According to people familiar with the distribution, the build was accompanied by documentation listing no know issues with the software update and asking that developers continue to focus their evaluation efforts on a previously stated list of 12 core system components. As was the case with recent builds, build 9D27 saw the addition of nearly a dozen fresh code corrections, bringing the total number of bug fixes baked into the impending Mac OS X 10.5.3 Update to nearly 215. Some of the latest tweaks target server certificates, printer plugins, Directory Server, and Apple File Server. More photos purported to be that of Apple's upcoming 3G iPhone have surfaced on the Chinese-language discussion forums of WeiPhone.com. The images depict an iPhone clad in a white plastic shell with added sensors and modified microphone and speaker grills, matching a recent description of the next-generation device recently posted over at iLongue. Although the images are almost certainly inauthentic mockups or third-party casings, they're being republished for the sake of discussion. Apple's Boston flagship to be largest yet? Finally, Gizmodo is reporting that Apple's soon-to-open flagship on Boylston Street in Boston may emerge as the company's largest yet by square footage. 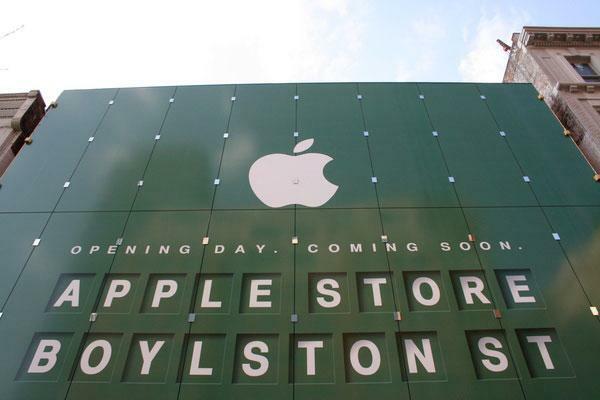 "According to a store employee, it's a good thing Boylston Street is so big: Apple estimates 1,500-2000 customers/hour will visit  more than 10 times the 160/hour that the average store gets," the gadget site reported. "It's something else inferiority-complex ravaged Bostonians can hold over New York."